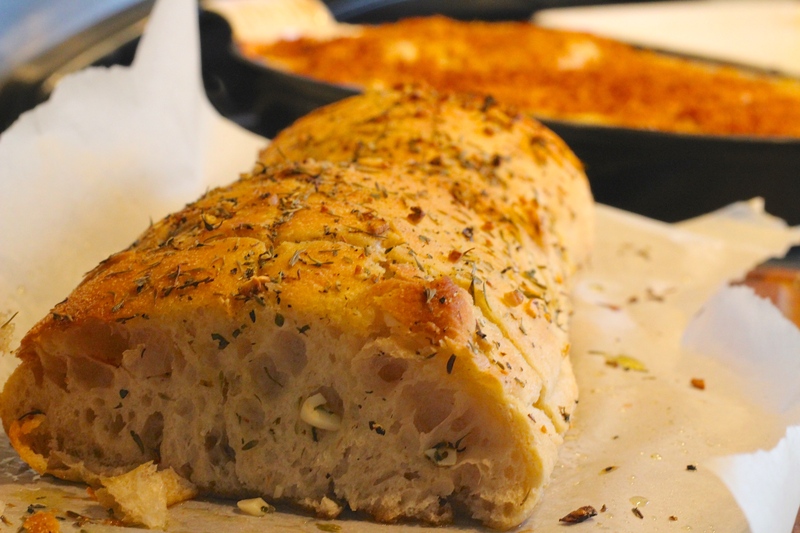 A different take on classic buttery garlic bread; a ciabatta loaf generously covered in garlic, dried oregano and thyme, rubbed with olive oil and sea salt and baked. A great accompaniment to a lot of dinners! Garlic bread is quite a departure from the normal sweet tooth bakes I post on here. However, it is still baked (so totally appropriate to post on here, right?!) and I felt quite an important one to post. I used to love garlic bread – I would have fought you for a whole plate of Pizza Express garlic dough balls anytime – dripping with butter, perhaps coated with cheese, and always stuffed full of garlic. And then when I gave up dairy, I was a bit stumped. I had always bought garlic bread. Or eaten it in restaurants. And I get that the premise is simply garlic and butter – but that never seemed quite the same when I tried it! 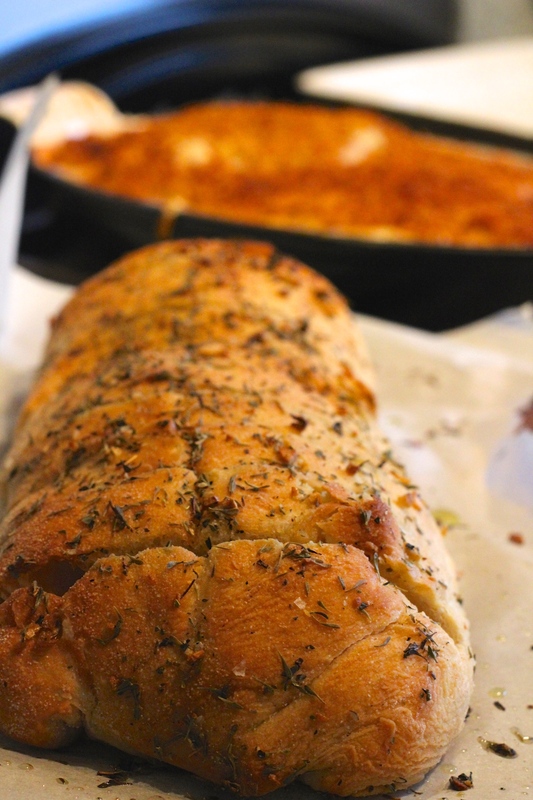 I eventually came across a Jamie Oliver recipe, which was a great change from a standard, buttery garlic bread. Instead of butter, it used olive oil. Instead of a baguette, it used a ciabatta loaf. 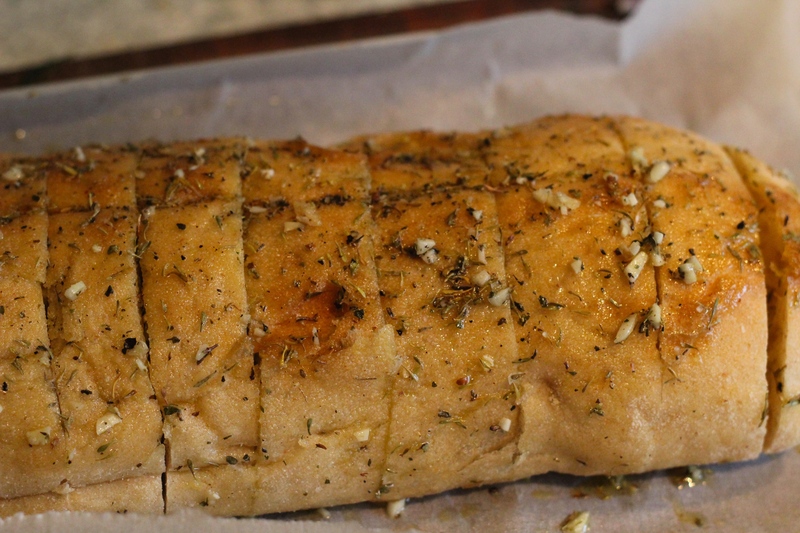 It was also covered in dried herbs and well seasoned. Now that looked interesting! That was something I had to try. And since then, I’ve mourned the loss of my dough balls no more. Well – a lot less! The recipe is really simple and uses all store cupboard ingredients. All you need is a knife and an oven. No excuses not to try!